Isn't this the best sketch ever? 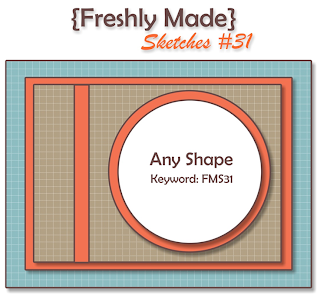 LOL Obviously it is my week to host the challenge at Freshly Made Sketches. :) My sketches seem a bit boring compared to some of the others, but I'm a pretty boring person! I hope you'll still find it inspiring. Feel free to flip it and do whatever you need to do to make it work for you! Now put on your sunglasses because my card is a bit bright! I figured since Awash with Flowers is leaving us next month I should probably use it a little. To share a little secret, two-step stamps stress me out a bit. I don't like coloring outside the lines and it seems that it always looks like that when I try to use this set. I cheated and didn't use the outline parts for this one. :) Separate it seems to be a much better set for me. I know I have issues...I also like eating out of divided plates. And we've been over my doily touching issues in the past. Perhaps I need medication? I hope you'll find time to come over and play along with my sketch this week! This is a great way to use Awash with Flowers Rita, I think it really works well not using the outline. Love your use of colour too, it's such an eye-catching card. PS. You're not the least bit boring! Really cute! I love the use of the Awash set in the circle. I really haven't used it much as I find it hard to get ideas for it. And now it's retiring. I really like how it looks here without the outline. I love the flower without the outline! I can so identify with your thoughts on the subject :) Love the burst of blue - great card! So pretty, Rita, and just the perfect brightness. I liked your comments: have you ever watched Monk? I started watching the reruns on DVD with my husband last year and I am hooked. We are on are second time watching them now! What a great colour combo. I don't think I would have thought about those together. I'm your newest follower from stampin' connection. Great job with this set Rita, love the unique colours. I think this sketch is terrific Rita....it's not boring to me at all! Love your colorful card, it is so pretty. You did a fantastic job with the flowers! Too funny! I have the same issue with two-step stamps! Your card is beautiful. I love your color scheme! Yes, Rita this is the best sketch ever. And you can't possibly think that your sketches are boring compared to the others because I know that mine are way more boring. I'm glad you showed me how great this stamp set can look because I never really liked it all that much and I'm not at all sorry to see it retire. Now that I've seen this I may take it out for a valedictory tour. Maybe. 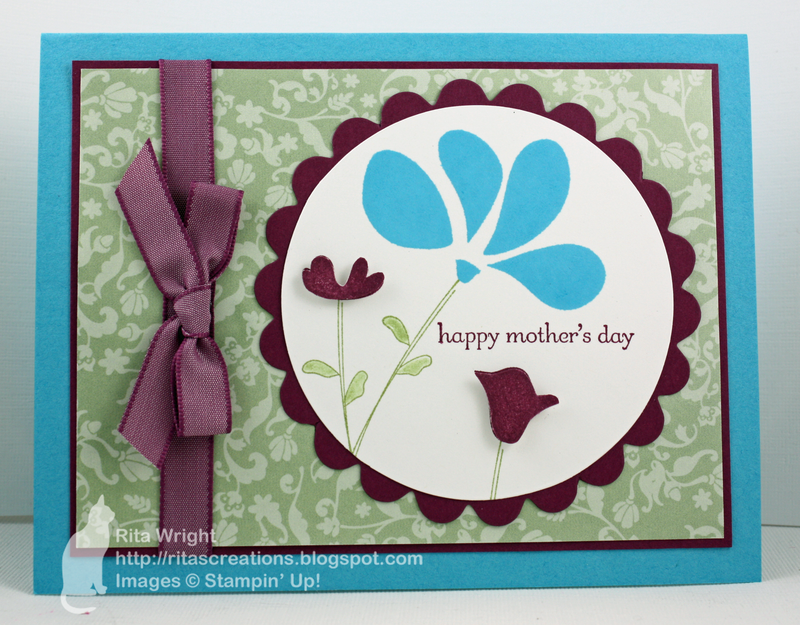 A fabulous card Rita ... that colour combination is beautiful and works so so well with that floral stamp set. I love your sketch this week and I love all the creations that have used it too!!! Oooh I do like these bold colours - it's nice to see something for mum that's a little different to the usual soft pinks. Great card! How pretty, love those whimsical little blooms!! This is a really pretty card!! Laila, but with some stamping!